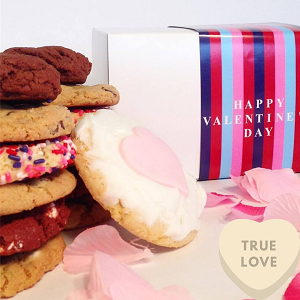 7 or 14 Cookie Collection~The Valentine Sampler, a sweet treat for loved ones, friends, or even you business clients. The Valentine Sampler is fun and colorful! A box just for the special day, with a wonderal portfolio of sweet treats. This is perfect for anyone and in the budget! We put it in our signature stripe Valentine's Day Box and include a special card with your message. Flavors Available Now for Your "Valentine MyWay Assortment!" Each cookie is 2.25 ounces and 3.5 inches in diameter. Chocolate Chip M&M: A colorful chocolate chip cookie combined with the famous Mars candy. Each cookie is baked with seasonal M&M's throughout the year. Sugar Iced: Sugar cookie with Buttercream Icing and a Valentine Decoration on Top. Sugar with Seasonal Sprinkles: Favorite amongst our younger fans and those who are young at heart, our sugar cookies are coated with seasonal sprinkles for that perfect treat. 2/5/2014 – What are the ingredients for a Blue Chip Cookie? Our basic brown sugar dough, which is for most of our cookies with the exception of our sugar cookies. BLUE CHIP BASIC COOKIE DOUGH: Enriched wheat flour bleached (flour, niacin, reduced iron, thiamine mononitrate, riboflavin, folic acid), molasses, sugar, butter (pasteurized cream and salt), eggs, baking soda, salt, natural vanilla extract. Sugar Cookie Dough: No molasses or vanilla extract.